We are also able to provide a wide variety of color choices including new sparkle lacquer finishes. 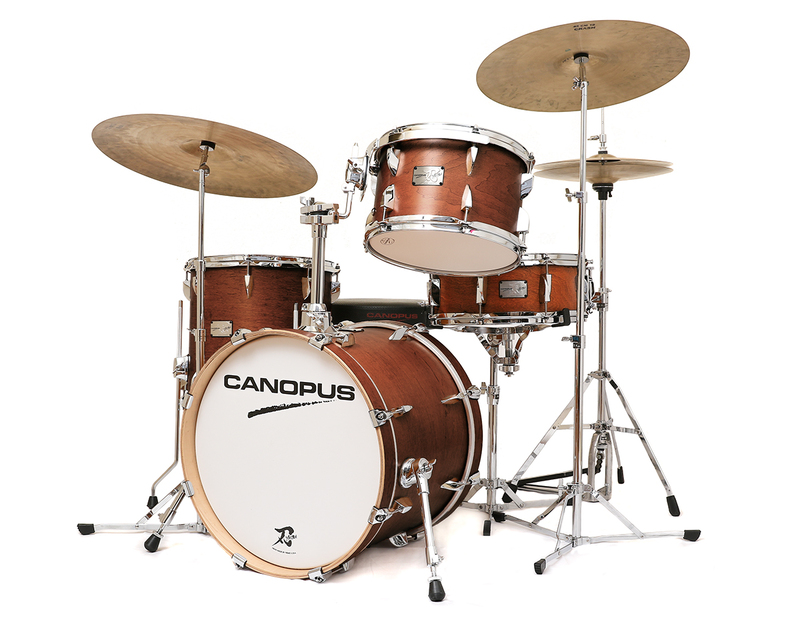 Stevie Wonder has his own Canopus drums! 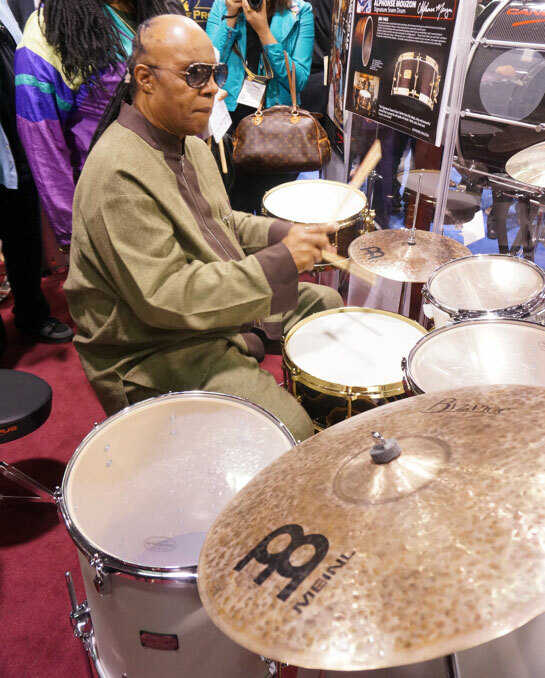 Everyone at Canopus is really pleased and honored that Stevie visited the Canopus booth at NAMM 2016. 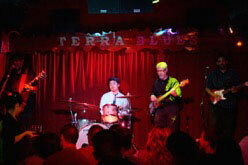 Prior to the show we had sent him, upon request, a Zelkova snare drum – which he really liked. He came to the Canopus booth to check out our other products. 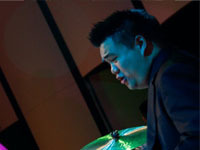 He played the YAIBA II Groove kit, with his favorite snare drum – the Zelkova. He loved the YAIBA sound, and decided he wanted it for himself. 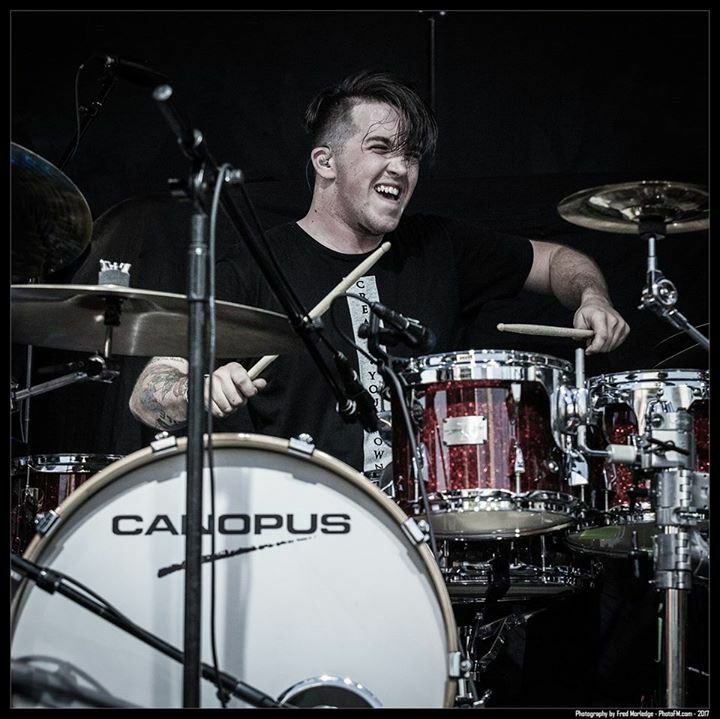 Words can not explain how excited and honored we are that such a great musician has chosen to use Canopus’ Yaiba drum kit and snare drum! 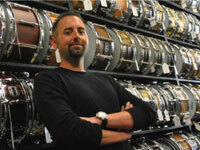 I believe that it is the best value in professional handcrafted drums. The Maple Bop kit is a jazz or funk lover’s dream, and the Birch Groove kit cuts through today’s high-energy music with beautiful sounding tone and power (when needed). g! I don’t think you could find a better set in this price range. The craftsmanship, hardware and lacquer are top notch. 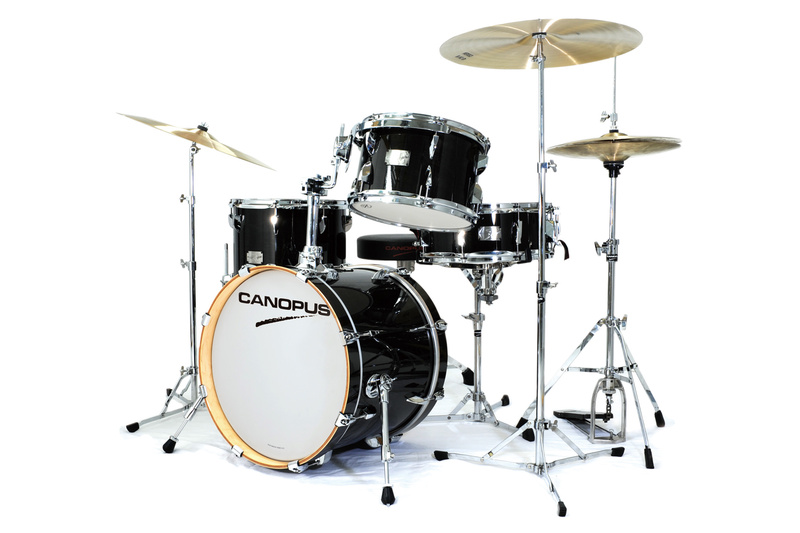 The Canopus Yaiba Bop Kit is a very versatile drumkit. 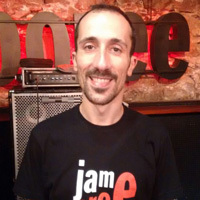 It has a very wide tuning range suitable from jazz to pop rock. 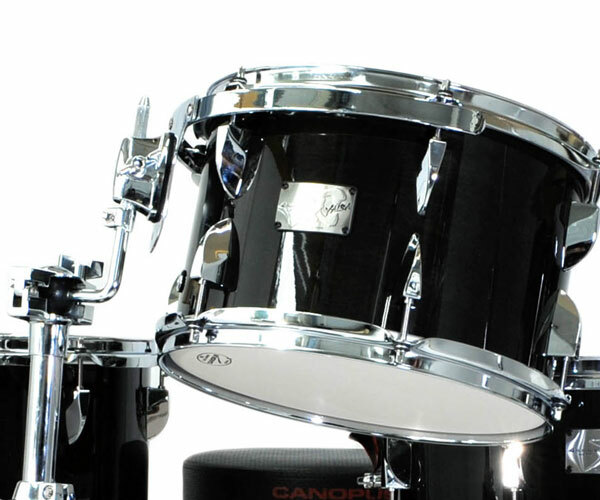 The toms and bass drum have a fast response and lasting sustain without too much ringyness. Also they have implemented their newest and more efficient lacquering process, which in turn lowers the price and increases affordability for the consumer. 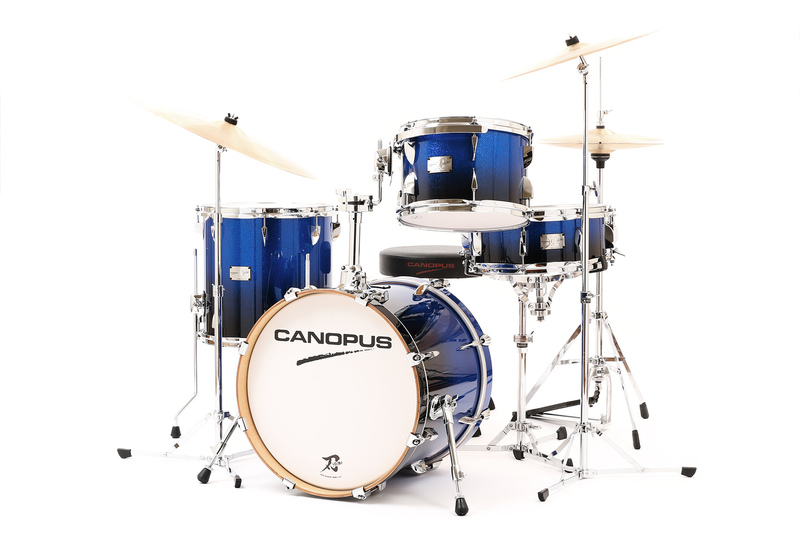 I highly recommend Canopus drums! 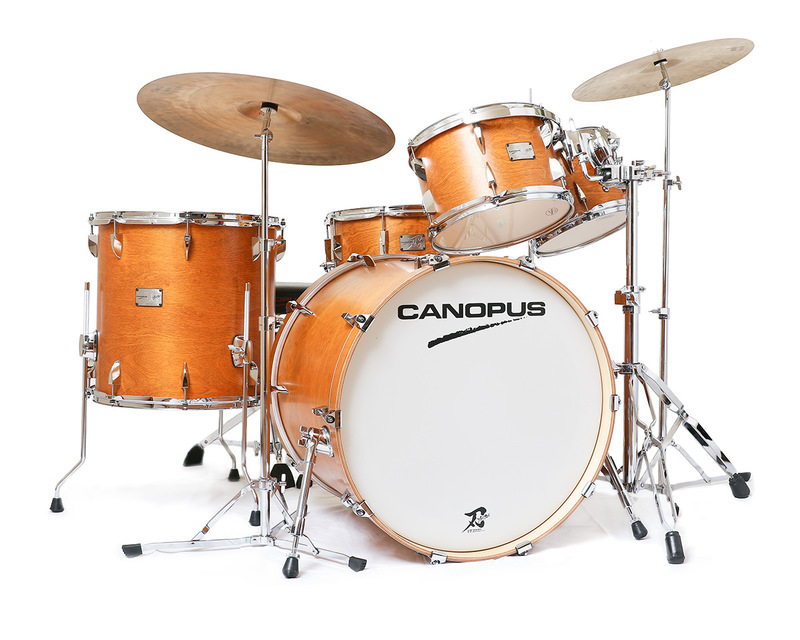 Canopus, a Japanese drum company that has been around for decades, is known for its superior craftsmanship and offerings in the high-end market. 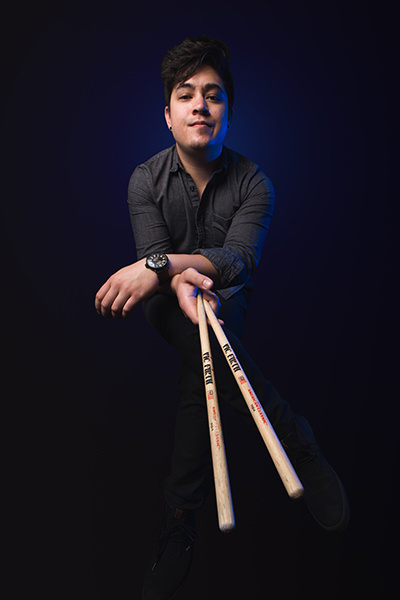 The company's New YAIBA line intends to take that knowledge and, with some minor modifications, come up with a series of drums in the mid-tier price range. 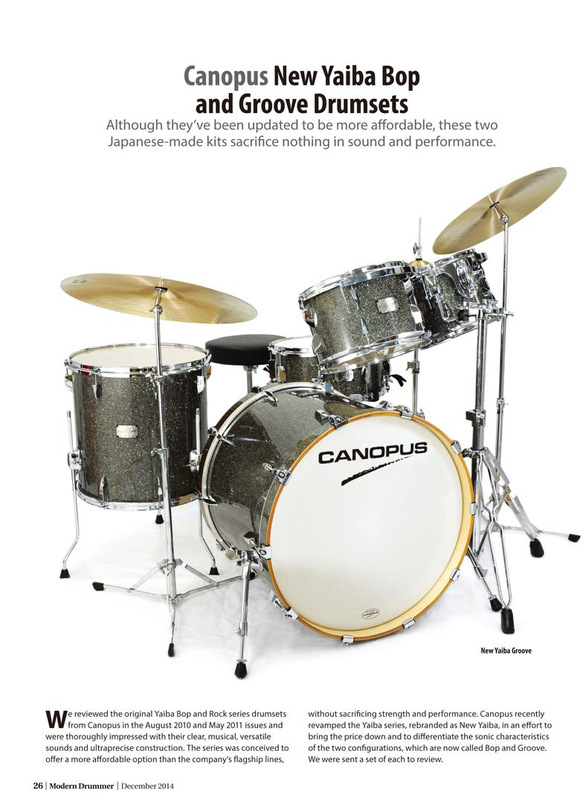 We reviewed the original Yaiba Bop and Rock series drumsets from Canopus in the August 2010 and May 2011 issues and were thoroughly impressed with their clear, musical, versatile sounds and ultraprecise construction. The series was conceived to offer a more affordable option than the company’s flagship lines, without sacrificing strength and performance. I had high expectations of these Yaiba drums before they even came out of the box. The Yaiba line has been around for three or four years and this is their new revised kit  revised for lower price but not lower quality. Both sets list for $1500 which is quite a price drop from the original Yaiba kits. Canopus's drums and sets have never been cheap because they dont make any cheap drums. This new Yaiba set is their first set that I think puts their sets within reach of the amateur or working drummer who wants to afford a very high quality drum set at a mid-line price. To achieve this price point on an already existing line, Canopus says that they adopted a different approach to the shell construction, heads and hardware from the original Yaiba kits. They also switched from nitrocellulose lacquer to a standard type of lacquer that reduced the time of the drying process and shortened their overall production time and cost. The new models also come in many color choices  Yaiba gray sparkle lacquer, dark red sparkle lacquer, ebony lacquer, and matte white lacquer. The word Yaiba means 'Japanese Sword' by the way. The Groove Kit sizes are very standard five piece sizes ; 18x 22 bass, 8×10 and 8x 12 toms, 16×16 floor tom, and a 6.5 x 14 snare drum. 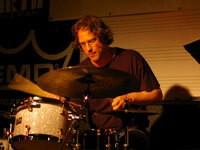 The shells of the Groove Kit are birch and have a nice punchy attack with a healthy underlying low end. 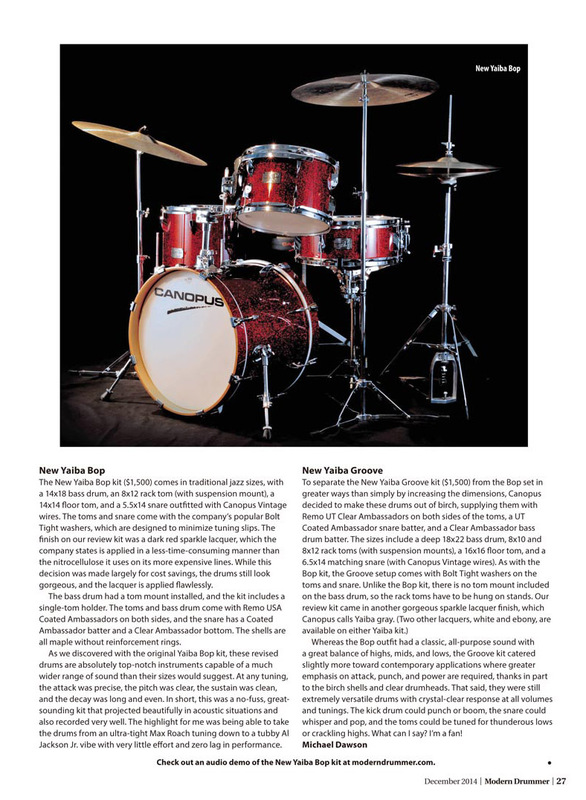 This kit is aimed at the rock, funk, pop, fusion and modern country player who needs a kit that can deliver substantial volume with great tone. Tom mount? The only negative about the whole kit for me  no tom holder on the bass drum or double tom stand. I realize there are a lot of drummers who mount their toms on stands, but a holder on the bass drum for two rack toms is the norm. No mount puts the consumer and dealer in the position of having to have one installed or providing a holder of some kind. The Yaiba Groove can be summed up in one concise phrase this is a very, very, very, very nice sounding and versatile drum set. This is a high level pro kit at a mid-line price. I would recommend this kit to anyone who is looking to step up to a nice five piece work horse kit with a finish that looks expensive. 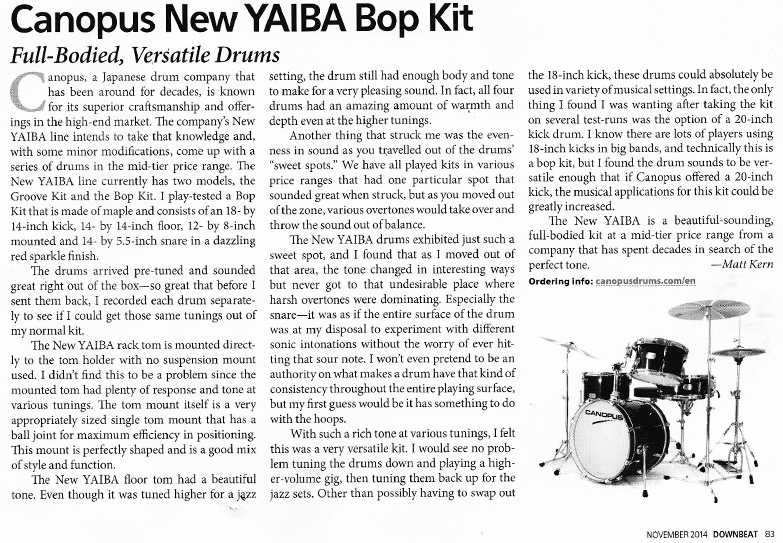 The Yaiba Bop set sizes are traditional as well 14 x 18 bass, 8 x 12 and 14 x 14 toms, and a 5.5 x 14 snare. The shells are maple and have the warm and pleasing sound that maple is known for. 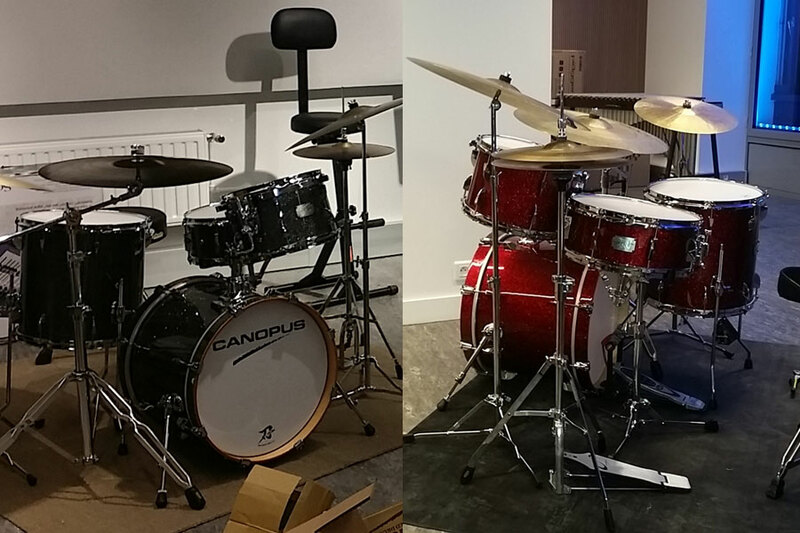 This kit is aimed at the jazz or small group player, but the bass drum can be tuned quite low and is more full sounding than the average 18” bass drum. It could be substituted for a 20” bass drum easily. 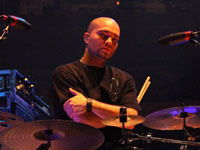 Snare response is exceptional from the edge of the head to the middle. 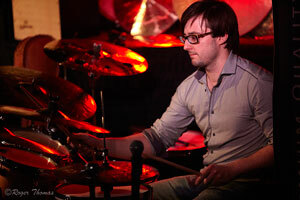 Snare wire tension sounded great at loose, medium and tight settings. 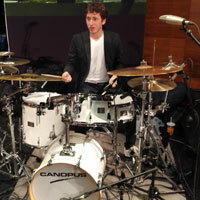 This is the biggest reason to buy this drum set. 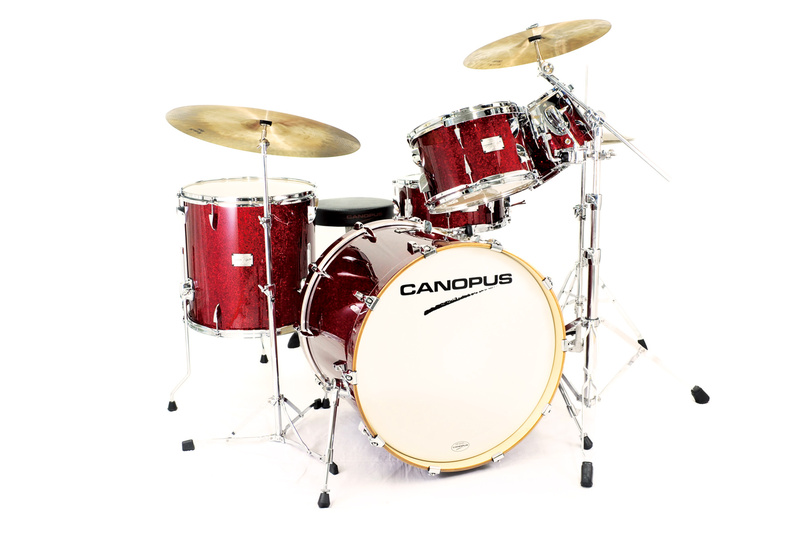 Canopuss 18 bass drums are known for their big, deep sound. I dont know what they are doing to achieve this, but they are in a class by themselves. The warmth and aesthetic of the Yaiba II Bop Kit are an aural and visual wonder! I'm in love with these drums for their dexterity and the attention to detail they were crafted with. They perform equally well in dead, low, medium, high, and cranked tunings! Plus the Yaiba Gray Sparkle... say no more... 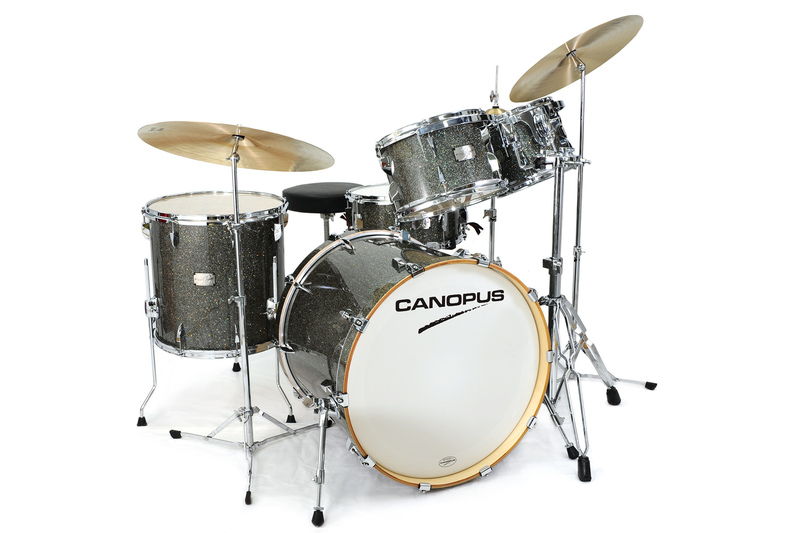 I'm very honored to join the Canopus family of artists. 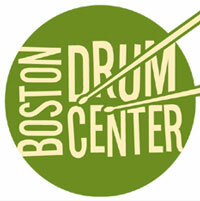 I have endorsed a number of great drums up to this point in my career. 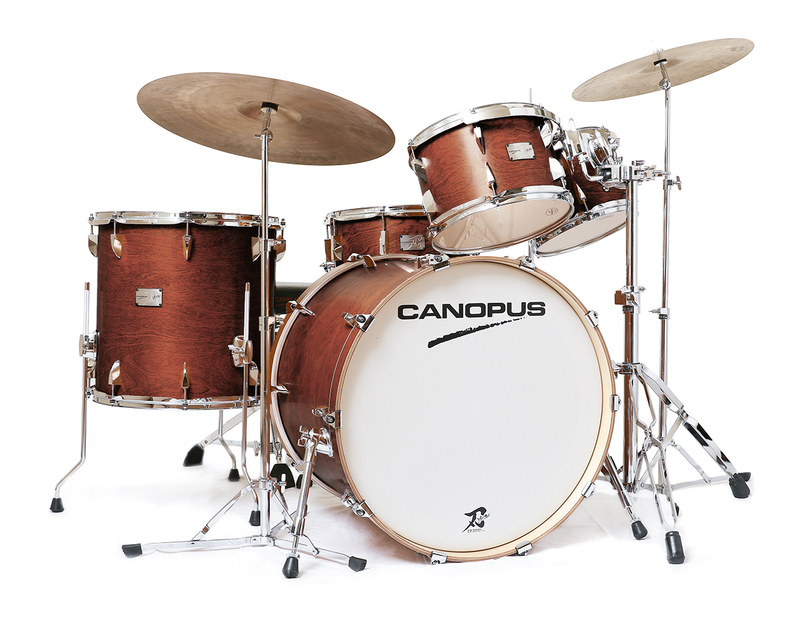 I must say that Canopus allows me to play with the nuance that I love to use in the music I play. They are transparent but focused in sound and wonderfully responsive. The attention to detail that these drums are made with rivals anything anywhere! I really love playing Canopus drums and will continue to play them for many years to come. 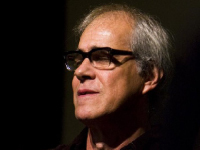 Thank you all at Canopus for my artist endorsement. The yaiba kits are great. Great shell construction, perfect finishes with zero overlap. They give me the booming toms that I need with a fat punchy kick, providing the perfect amount of attack and clarity in each hit. These kits are Timeless. finishing are amazing, students at IMEP • Paris College of Music are very lucky ! 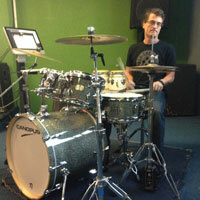 I tried different ways for tuning the sets, and each brought a great result : an excellent drum set ! "The Yaiba Groove kit from Canopus is a beautifully crafted, all birch shell drum kit that has the warmth and attack that performs well under any venue and any genre of music. 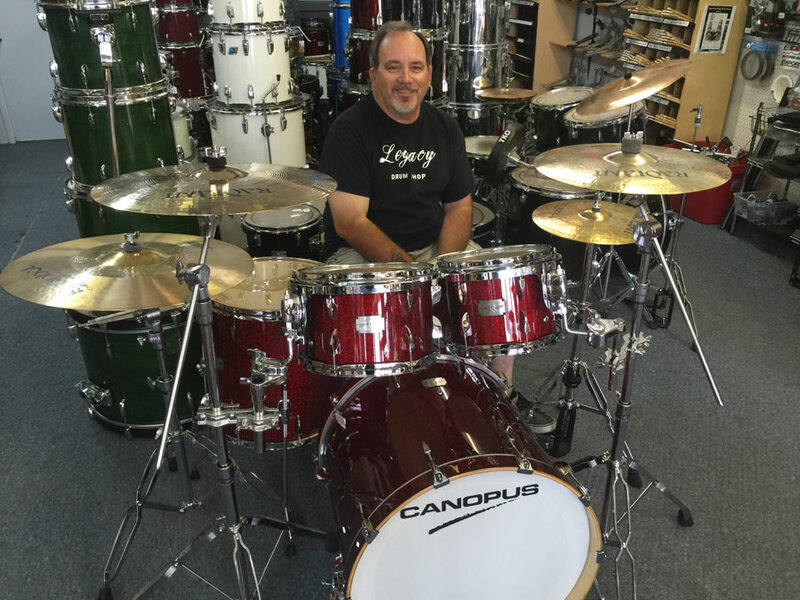 It sounds great, feels great, it is THE best drum kit I have ever played." I get compliments all the time from other artist and sound engineers how well this drum kit sounds. 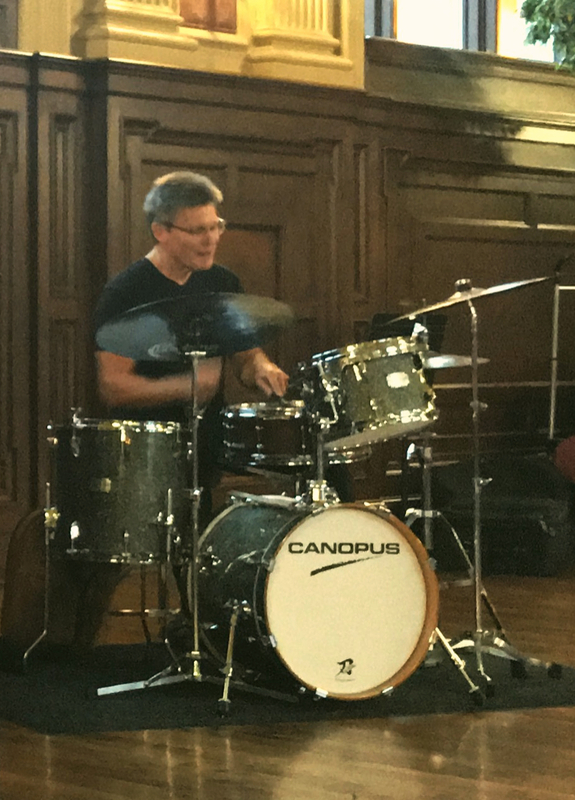 Dutch Opperman from Altitude Lighting said about the Canopus Yaiba Groove kit, " This drum kit is a great sounding drum kit, it really punches through the mix and has a great warmth to it." I am very pleased with the Yaiba Groove Drum Kit. 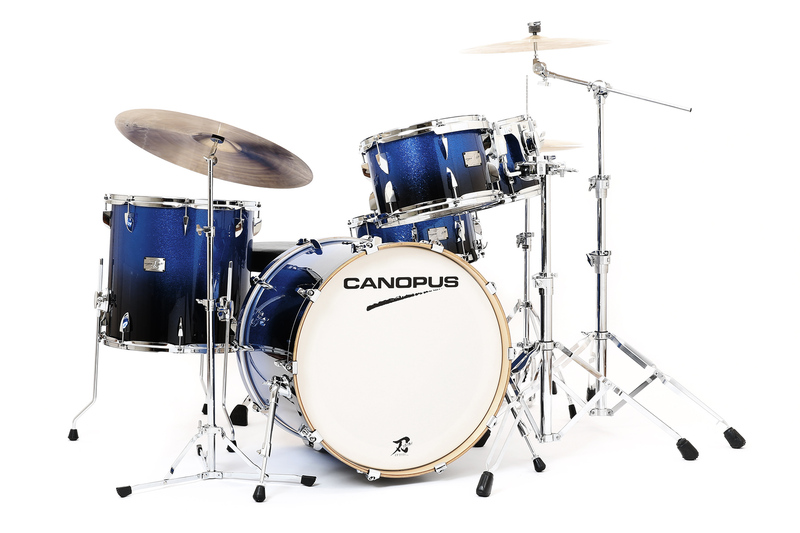 Thank you Canopus for making such an outstanding drum kit. I LOVE THIS DRUM KIT!!!! 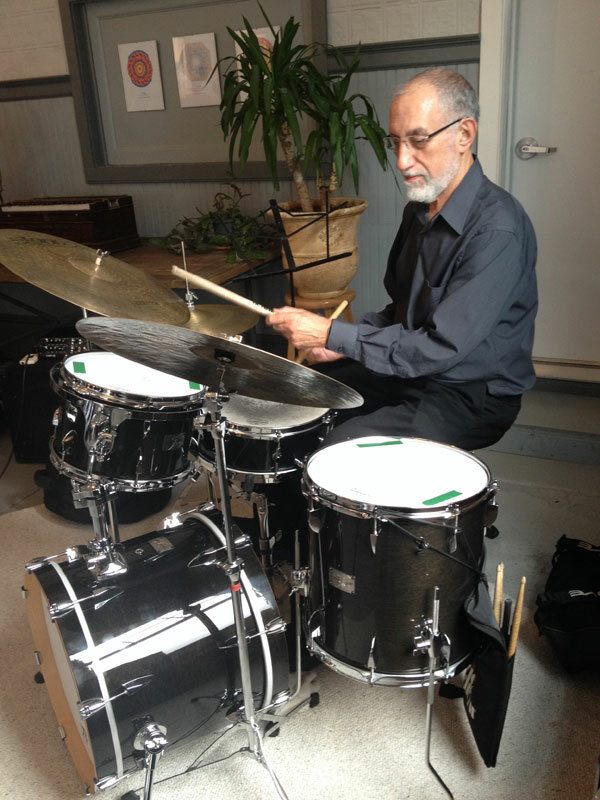 As Chair for the Drum Program at Musicians Institute I must be sure to provide only the highest quality equipment to our students. I have found that quality in the new Yaiba series from Canopus. They are the best drums in their class. The best kit I have played. rock club. theater. or auditorium the great look and sound never let you down. top shelf drums. 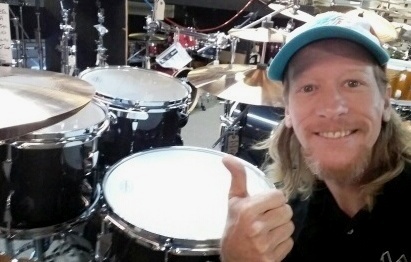 The Sword kit is my all around compact drum kit. 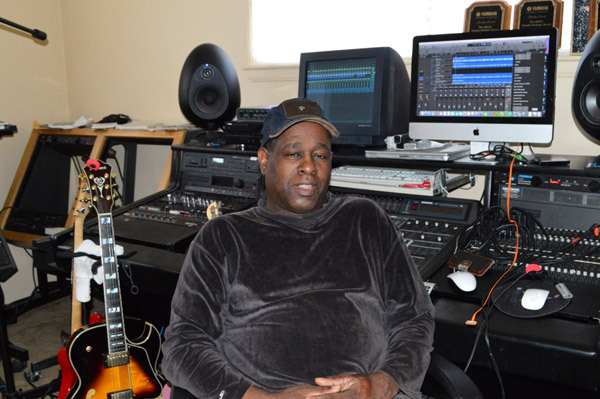 Cutting through all styles and music situations from vintage to todayʼs modern music with such power and a dynamic range. Its Great look and sound are definitely, without a doubt, a master piece. Such a pride!